From a distance of sixty years Alexander Calder’s mobiles, stabiles and standing mobiles embody the best attributes of modernist sculpture. They possess a self-sufficient ecology of balanced colour, shape and weight. But their success also carries the risk of fatigue. In singular isolation, they can feel overexposed and even drained of life while occupying an iconic status in public collections. Pace’s London show has ambitiously assembled the post-war sculptures made between 1945 and 1949 facilitated by the renewed availability of aluminium. Lit and elevated on circular platforms, the works are given the reverence of a museum display. Our enchantment with the mobile reaches back to childhood and suspended toys. 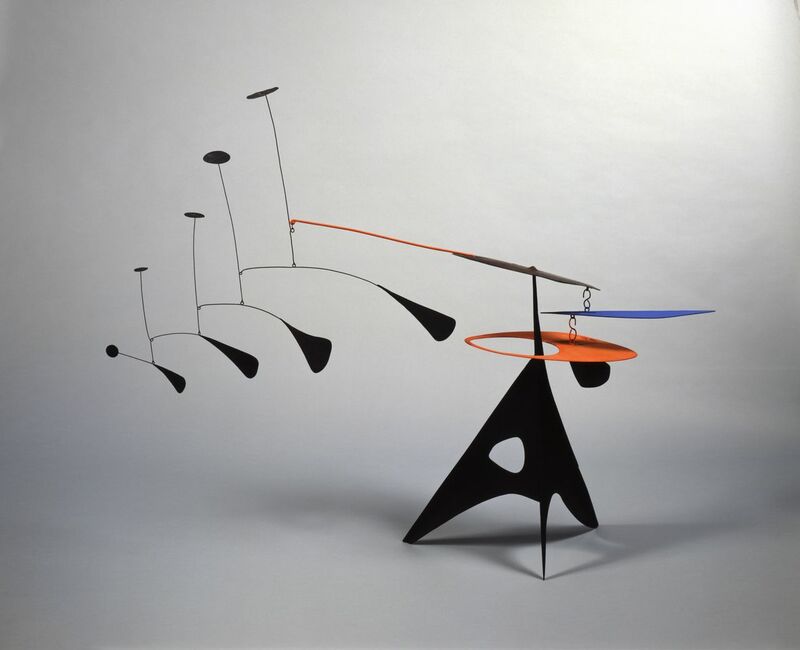 Calder’s sense of pleasure in aligning organic forms with physics is indisputably charming. These post-war pieces revive optimism in art and refute the anxious introspection of Abstract Expressionism or European Art Brut. ‘Blue Feather, 1948’ stretches out into space along horizontal and vertical axes. Splashes of black droplets are interlaced on wire like growing leaves and produce tension with a pierced red disc sitting flatly over the spike of the supporting tripod. Energy moves the structure until equilibrium is found. Hand in hand with solid form, light also articulates the sculpture in shadow across the floor. Calder’s watercolours exhibited simultaneously here employ a language of primitive figuration as if drawn on the surface of a cave. Other pictures present biomorphic spirals and orbs redolent of Miro’s Surrealism. But these sketchy washes of colour and line resemble private studies and confirm Calder’s natural affinity with sculptural process rather than suggest a dextrous application across media in the vein of Picasso. Each Calder sculpture, whether floating in free space suspended from the ceiling or sitting deftly in miniature on a plinth and stored in a re-conditioned cigar box, finds an intrinsic co-ordination of colour, line, materials and flow. What Calder paradoxically achieves is stillness through activated animation. His kinetic experiments are entrancing and satisfying, aligning material manipulation with observation like the raked pebbles of a Zen garden.